Rin has drawn his sword in order to battle the Impure King, to Mephisto’s glee and Yukio’s dismay. Rin decides he has to be who and what he is – a beast who burns everything. Meanwhile, Shiemi is battling to save Kamiki from the fungus which has engulfed her. Is she strong enough to save her friend? In the aftermath of the battle, Yukio is furious, but Rin stands his ground. Yukio begins to see he may not always be right. Everyone retur5ns to the inn, where Tatsuma is healing and Mamushi is stricken with guilt for her part in what has occurred. Juzo attempts to console her. Rin awakens to find himself lying next to Shiemi. She explains she came to check on him and fell asleep. Shura confronts Mephisto and demands to know what he has in mind for Rin. As usual, he’s quite enigmatic. Juzo announces he is taking Mamushi’s hand in marriage, although she hasn’t agreed to accept his offer. The ex-wires amuse themselves at Rin’s expense. They pretend they have to listen to him because he’s Satan’s son, even as they explore Kyoto. Finally, it’s time to leave – but not back to True Cross Academy. The ex-wires are told to get some swimsuits, they’re going to the beach! This concludes the Impure King arc – at least I think it does. Rin is coming to terms with who he is, and so are the others. Yukio not so much. But he has his own baggage, and sometimes it’s hard to let go of preconceived notions about one’s family. The beach story about a forgotten god is great, and Juzo and Mamushi are hilarious. I can’t help but feel he’ll wear her down with time. Rin is every bit as headstrong and impetuous as he ever was but he is finally learning some measure of control. Mephisto is as devious and conniving as ever, but down deep, I think he has Rin’s best interests at heart. Another great volume, looking forward to more. 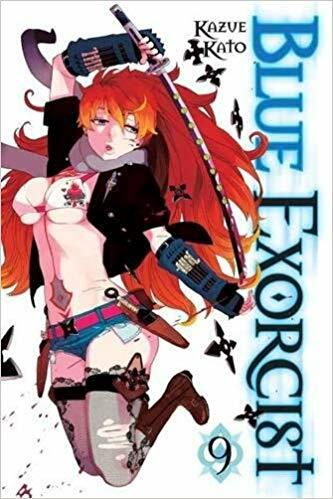 This entry was posted in Reviews and tagged Blue Exorcist, Book review, Julie Lynn Hayes, Kazue Kato, paranormal, Viz Media on December 2, 2018 by wedbriefsfic.